“We warned them. Harvard puts out a study that confirms what we saw and they are still denying it,” said the mayor of Cayey. JUNCOS, Puerto Rico — Harry Figueroa Alvarez relied on an oxygen tank to sleep at night. 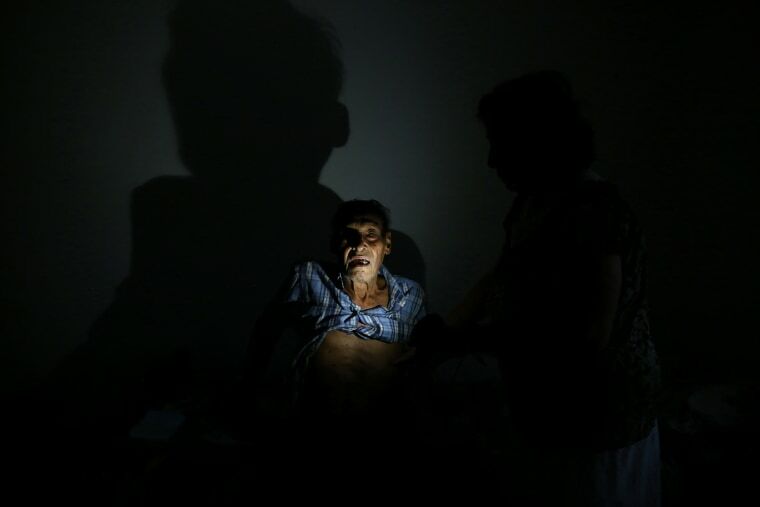 After Hurricane Maria, the loss of electricity meant he couldn't power the equipment to alleviate his respiratory condition, said his daughter, Lisandra Figueroa Flores. Her father started sleeping outside his house to try to breathe more fresh air. But it wasn't enough to make up for the oxygen tank. One day he collapsed, and a day later, he died in a hospital bed. "My father was 56 years old and for lack of power and air he died," said Figueroa Flores. Puerto Ricans like Figueroa Flores are reeling from the news that more than 4,000 people may have died in the aftermath of Hurricane Maria, according to a Harvard study by independent researchers from Harvard's T.H. Chan School of Public Health and other institutions that was published Tuesday in the New England Journal of Medicine. Puerto Rico's government stands by its official death toll of 64 and is waiting for the results of a government-commissioned George Washington University study to be published this year. But for many Puerto Ricans, the Harvard numbers make sense, after what they witnessed in their households and neighborhoods. “Based on the amount of people we saw when we visited communities, many of them sick, without power, incapacitated and without respiratory machines and the proper way to store medications and get to a hospital, we knew these people were going to die,” said Rolando Ortiz Velázquez, mayor of the town of Cayey. Parts of the town still don't have electricity, eight months after María. The disconnect that exists between the government's official numbers eight months after the hurricane and the Harvard study highlights Puerto Rico’s ongoing data-reliability problems, according to statisticians and experts. The official death toll of 64 is primarily based on Police Department numbers that only account for deaths directly related to the hurricane, such as a tree falling on a house during the storm and killing a resident inside, said Mario Marazzi, executive director of the Puerto Rico Institute of Statistics. But statisticians like Marazzi and the authors of the Harvard study argue that it's important to look at different data that can account for indirect deaths, such as those caused by medical complications related to a lack of power. “There’s a CDC guideline for disasters that defines what are directly related deaths and indirectly related disaster deaths, and we saw that those were not being applied properly in Puerto Rico,” said Satchit Balsari, one of the Harvard study authors, in response to a question from NBC News during a press call and referring to the Centers for Disease Control and Prevention. Before Tuesday's study was released, some reports from Puerto Rican investigative journalists and major U.S. news organizations published several months ago had put the death toll at nearly 1,000, still far higher than the government's official death toll. After her death, I listened to @HamiltonMusical's "Who Lives, Who Dies, Who Tells Your Story" a lot. My titi deserved better than to be a number in a pile of dead. She deserved that her story be told. On Tuesday, Puerto Rico's public safety secretary, Héctor Pesquera, told reporters that the Harvard study is based on a survey. "It is not based on scientific data,” he said, adding he had not studied the Harvard report. But Caroline Buckee, a Harvard researcher and one of the report's authors, said to reporters that the study, where field researchers visited more than 3,000 households across Puerto Rico in three weeks with a budget of about $50,000, helped fill crucial gaps about post-hurricane conditions in the island's households. “This shows that in a pretty cost-effective way you can get complimentary information during a disaster that could be useful to governments,” Buckee said. One of the biggest data gaps Harvard researchers found when trying to count the hurricane death toll was in the way death certificates were being issued during the hurricanes. “There needs to be better training in order to count hurricane-related deaths on these certificates — it’s not like a regular death certificate,” Balsari said. This is not the first time researchers raise concerns involving the issuance of death certificates in Puerto Rico. In 2010, the Puerto Rico Institute of Statistics released a report about the island’s mortality rate. In it, the institute noted that there were errors in the way experts were labeling causes of deaths in such certificates. Researchers also note that limiting data that can be used, shared and studied after a disaster hinders recovery efforts, which rely on a more comprehensive look at the situation on the ground. 2nd hospital running on generator. He & so many others must be counted! The institute Marazzi oversees was created as an autonomous agency to ensure accurate data collection separate from government and political pressures in Puerto Rico. But the government is stripping the institute of its independence as it consolidates it under a government agency, despite swift criticism from scientists, advocacy groups and lawmakers — including the American Statistical Association and 15 members of the U.S. Congress who, in a letter, expressed bipartisan support for PRIS’ independence and Puerto Rico’s "need for public, independent and unbiased data." For many islanders, the Harvard study's numbers estimating that deaths were more than 70 times the official death count was an affirmation of what they have been saying all along. "There’s many more, many more,” said Pedro Lozada, 76, a resident of Caguas, who is grieving the deaths of his wife, Consuelo Morán, and his son, Miguel Lozada Morán, 50, who had special needs. They both suffered heart attacks after the hurricane and had no access to a working hospital. “Where was the power? Where was the help?” said Lozada. San Juan Mayor Carmen Yulin Cruz, who was criticized back in November when she suggested that the death toll could be in the hundreds, said, "This is what I've been screaming at the top of my lungs." Cayey's mayor, Ortiz Velázquez, recalled feeling “abandoned and distressed” when he and others raised concerns about the death rate with island officials. “We warned them," he said. "Harvard puts out a study that confirms what we saw and they are still denying it." While the Harvard study is only an estimate — George Washington University's upcoming epidemiological study is reviewing all deaths after Hurricane Maria — its authors said that having comprehensive estimates could help governments better address future catastrophes. Puerto Rico’s hurricane season officially starts on Friday. Nicole Acevedo reported from New York, and Natalie Valdés from Puerto Rico.